I hope you’ll join for tonight’s livestream at 9pm ET / 6pm PT on the BlogAid Facebook Page. It’s open Q&A time for what caught your attention in this week’s tips or whatever you’d like to discuss about your site success. And, I always have breaking news for the day too. So come join us live for the party. It’s been a beautiful week around here!! I’ve been enjoying warm spring days on the deck while doing my site success research and writings. And it was so pleasant in the evenings that I nearly fell asleep out there. I hope you’ve been enjoying better weather too. I’ll be putting in my request to move to a new host on Wednesday. I believe it will be all settled in 24 hours, but in an overabundance of caution, we will be skipping a week in our live DIY SEO workshops, as I won’t be able to add new content until after the migration completes. I don’t expect there to be any disruption of general access to my sites, but I will need to take the sales pages down for new membership registration from Wednesday through at least Friday morning, just to be sure. And, it may take a while for my email to catch up with me during the move too, as they are domain related and the DNS will be pointing to a new place as well. So, just bear with me as I make the move. And if all goes well, I’ll tell you where BlogAid’s new home is. Woohoo! I’m thrilled to tell you that the Gutenberg course creation is underway!! I know you’re going to love this training because it doesn’t just give you the basics. It goes right into getting you up to speed with all the stuff you do to create posts right now. Plus it includes features that are exclusively Gutenberg, so you can start using those right away. This week I’m creating the tutorials for building landing pages. And then I’ll move on to theme design blocks. And, I’m including Skill Builders at the end of every training. These will help ensure you get the most out of each tutorial and help you hone those skills so you’ll be ready for the next tutorial. There is a whale of a difference in watching someone else do something compared to doing it yourself. These Skill Builders will help you lock in the training because you learn by doing. They will also serve as a quick reference to see how to do some of the skills so you don’t have to watch the whole video again. The new Gutenberg course will be on the Teachable platform. I’m liking it so far, but haven’t dived deeply into setting it up and such, as I just needed to know all that I could do with it, like quizzes and PDFs and such, so I would know how to lay out the instruction material. I’ll be releasing this as a limited trial run to get feedback from my peeps that are in my other courses and see how they like it. That way I’ll be able to make those adjustments before doing a grand opening. 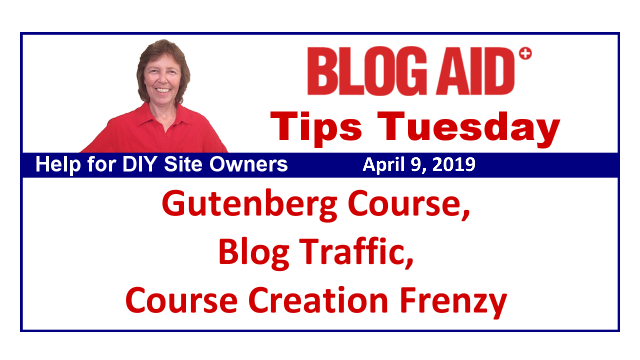 In some of the blogging groups and business groups I’m in, I’ve heard there is an online course creation frenzy happening right now. That is one of the reasons I want to try out Teachable, as it seems to be a great entry-level platform for folks new to course creation to use. And my recent Webmaster survey indicated they have a lot more clients interested in creating courses too. I’m seeing all this as future business for BlogAid, as I have so many years of experience in creating and running courses that help me make a full-time living. Are you interested in created a course? Are you seeing your blogger buddies do it? Leave us a comment on the blog, or wherever you see this post online. And come to our live chat tonight and discuss it with us. As y’all know, I completed all of the speed tests I’m going to do for now. I also did a head-to-head test on the paid versions of WP Fastest Cache vs WP Rocket. That post is coming soon, as I spent last week working with the WPFC dev on a couple of things, and have a couple more to go with SEO testing on both for how their lazy load functions work, as they are a little different. But for a free caching plugin, nothing beats WP Fastest Cache. And I’ve already updated my settings post for it to include the new features in the paid version soon. So go check that out. And I’ll have ways for us to decrease those loads as much as we reasonably can. For now, be sure to jump over to the Speed section of the Helpful Posts page to see all the ways you can speed up your site right now, plus how to run your own tests accurately. Kate Ahl has returned from her recent speaking engagements and we’re both working on a new post for her site about all the different pinning methods. We’ll also be doing a podcast on this topic when the post is ready to release. I’ve got a few more tests to run based on Kate’s suggestions. I believe these will really clear up your understanding of how all this works and ways to maximize pins from your site. And, I will have news on this front about possible new features in Social Pug in tonight’s livestream. I was delighted to meet live with my Webmaster Training peeps yesterday to reveal the most recent survey results and to discuss their client and theme dev types and needs. Their direct feedback is what drives the training in the Webmaster courses. What I see is that most of them have site security down pat, but they want more help with doing site audits and performance. It was about half and half with folks wanting to do their own audits and fixes, and then folks wanting me to do the audit and/or help with the fixes. So, I will be white labeling the audit service for them and giving whatever combo of help works best. I’ve also got clearer direction on the big revamp of the course levels that I’ll be working on throughout the spring and summer. That will include not only moving some of the existing courses around, but also include new tutorials with the tips and tricks I use during after-audit fixes. The point of all this is to help more designers step into more site tech at the level that works best for their business model and client types. If you are a designer, or know designers who need this type of support, please do send them on over to the training, or to contact me for a chat. If you’re following me on Instagram @HeartwoodArtCreations or Heartwood Art on Facebook then you know how much progress I’ve made on the mitre saw stand. I’ve got two more posts in the works for creating a straight edge for your circular saw and one on how to safely cut plywood. I need to get those finished up and published before posting more about the mitre saw build, as I want to reference them. Oh my gosh, the number of pictures you have to take to tell the story!!! READ: The Art of Storyboard and Photojournalism in Blogging which is the latest post in the Hobby to Money-Making site series about how writing the music for commercial jingles helped me create my blog posts, and has everything to do with why getting these first few blogs out has taken so long. There has been an absolute frenzy of new Block creation since Gutenberg rolled into the core of WordPress. So much so, that keeping up with them has become a bit of a headache. I’m very excited about the new Block Manager coming in WP 5.2 release at the end of this month. It’s an improvement on the Most Used block function. I’ve got the 5.2 beta on my Gute test site and I’ll be seeing how this function works as I continue to create the course, as creating new blocks is what drives this thing to bring your most used to the top of the list. One of the blocks that has been severely lacking in Gutenberg is proper column layout. WP 5.2 has some fixes for that, and I’m eager to try it and/or other plugins that already do it better. Genesis has long supported super column layout and I use it a LOT on pages. In fact, you can see it on most any BlogAid Page, including several layout examples on the Site Services page. Testing out which way to go with this is critically important for me to know before I switch BlogAid to Gutenberg. And you bet it will be in my Gutenberg course too. WP devs are buzzing about the new JIT compiler that will be coming in PHP 8. I don’t expect any of you to read this post. I’m mentioning it to point out how being a regular Tips Tuesday reader contributes to your site success and peace of mind. I spend hours every week following 80-100 blogs to keep all of us way, way ahead of the curve. When there’s something on the horizon, like changes to PHP, I let you know. When it’s time for you to do something, I let you know. And when everyone else is panicking to meet a deadline on something they’ve never even heard about, you’re calmly going about your business, because you took care of it way ahead of time. And the biggest benefit is that you don’t make an uniformed, knee-jerk decision over the latest firestorm and goof up your site. My site audit clients come straight to our Facebook group to get the real skinny on any news flash too. The PHP coding language is ever-evolving. Now that WP is finally onboard with starting to require a minimum version, more site owners are going to start panicking over those notices popping up. You’ll be able to point them to the place where you got your help that keeps you calm and way ahead of the curves through all of these plugin changes we’ll be dealing with from now on. My long-time followers got step-by-step instructions with getting on the latest PHP version 2 years ago. And they never miss a Tips Tuesday because they like staying that far ahead, and calm. READ: How to upgrade your PHP version if you haven’t taken care of this yet. You can also find that article on the Helpful Posts page in the PHP section. I am following this design trend very closely, as it can radically impact site speed. FontAwesome is traditionally what has been used in both theme and plugin design for all manner of icon display. These are most often seen in social share and follow buttons, but are also used in homepage widgets and even sticky headers and regular headers for email and phone icons. Besides being a behemoth font library, these images don’t scale well for mobile use. The answer to these issues is to use SVG images – which are Scalable Vector Graphics. The problem is, they have been slow to get full browser support – but that is rapidly changing. I’ll be working with my Webmaster designers on this in the new performance tutorials. And, I’ll also be working with the devs of Social Pug and Scriptless Social Sharing by providing them with my test data and any other support they may need to make their plugins faster and still look great. I’ll keep you posted on how all that goes. For now, do go read this post on the history of using font icons and the current status on browser support, plus all about how to start integrating SVG images anywhere you can in your designs. This post on Blogging Pro has 5 steps to increase your blog traffic. And they are billed as easy. But I want to pick on one of them as to whether it’s easy or not. What does it mean to write content to go viral? There’s nothing easy about that. In fact, me and every blogger I know writes a post they don’t think much of, or is even off-topic for their blog niche, and it ends up going viral. I’ve seen the same thing with folks who work really hard to make beautiful Pinterest images. And some blurry picture with no text goes viral on them. You can’t always predict what folks will latch on to. That’s why it’s so important to try new things – not only new topics, but new ways of presenting the info. So what if it bombs? Just write another post on that thing in your usual style and see how that does. Maybe it will bomb too. This is sort of like A/B testing. It will give you a better idea if the response is the topic or the way you present it. And now and then, do something off-the-wall that gives your readers a different insight into you. Don’t make every post a recipe or DIY project. There’s more to you than that. Deepen your relationship with your readers and be more to them than a “what’s for dinner” answer. Honestly, I think this is where video shines. I’m already getting comments on my Heartwood Art videos about my personality, and that’s what folks hook into as much as the wood craft stuff. Same with BlogAid. Folks like my no-nonsense approach and firehose of info that doesn’t waste their time. Even if it’s just your voice narrating still shots, it’s still way more personable than text in your blog. My surveys show that many of you listen to the Tips Tuesday podcast even while you’re reading the post. That says something to me, and should to you too. There’s so many fun ways to engage with your audience beyond blog posts and Pinterest. I’m having a ball over on Instagram with Heartwood Art. It reminds me of how fun Twitter was when it first started. I’m not seeing a lot of traffic from it yet, but I am making new connections that I’m not getting anywhere else. And it all stems from trying something totally new. What new thing do you want to try? Leave us a comment on the blog, or anywhere you see this post online. No one I know puts out *more* and *better* information than you, MaAnna. I really appreciate all the work you do so we can keep up with the important stuff going on. I hope your website move goes great. Thank you. Thank you so much, Christian! !